Nasu Kogen Beer is a Japanese craft beer brewery based in Nasu city, Tochigi. It was founded in 1996 but its origins lie in a time older than that. Nasu Kogen Beer’s president, Oyamada Takashi, was born into a family that ran a retail furniture-making business started by his grandfather. 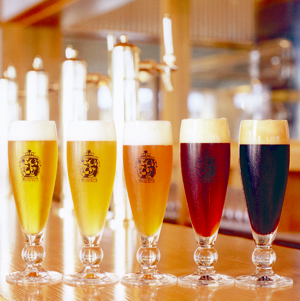 However, the company began to downsize its operations and soon after, Oyamada-san suggested the opening of a brewery. He and two others, head brewer Fujita Masafumi and Noda Ryohei, travelled around German breweries to improve their knowledge and understanding of brewing beer. Nasu Kogen Ai – a 5% lager that is named after Princess Aiko of the Japanese royal family. Nasu Kogen Weizen – a 5% German hefeweizen style beer. Nasu Kogen Scottish Ale – a 5% Scottish ale brewed to a traditional recipe. Nasu Kogen Stout – a 6% stout that has won gold at three international beer competitions. Nasu Kogen English Ale – a 5% English pale ale style beer. Nasu Kogen Secchu Jukusei Shinzan Pilsner – a 5% Czech style pilsner that is brewed using water from Nasu Miyama. Nasu Kogen Ichigo Ale – a 5% fruit beer that is brewed using locally sourced strawberries and is on sale from late spring onwards. Nasu Kogen Ai no Hana – a 6.5% heller bock beer that is sold from spring onwards. Nasu Kogen Yume – a 5% lager that is brewed using locally sourced mountain water and part of their winter seasonal lineup. Nasu Kogen Momiji Ale – a 5% spiced / herb beer that contains momiji, maple, leaves and on sale from Autumn onwards. Nasu Kogen Nine-Tailed Fox – an 11% barleywine that is aged with versions going back to 1998 available. On sale from summer onwards.